Working on the hotel website design, you need to make it look luring and captivating to the target audience, evoking their curiosity and the desire to be the first to visit new destinations. 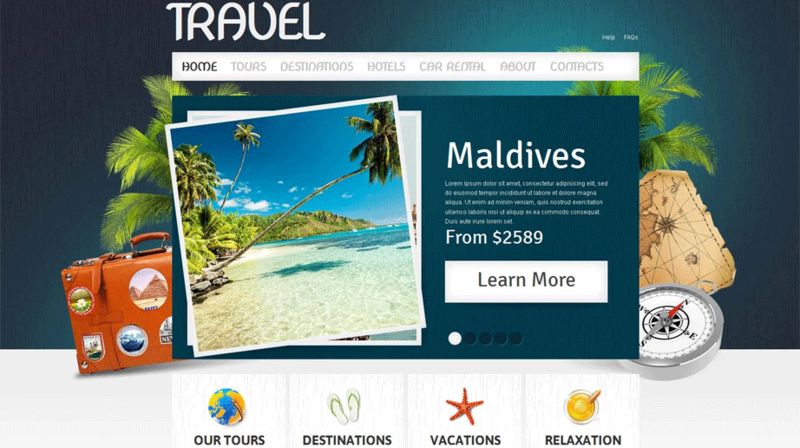 Travel and hotels websites are commonly abundant in the use of photo and video content. Making such web resources usable and scannable are the top priorities for everyone running the hotel and travel businesses. So, how can one build a luring website while keeping the necessary pieces of content in the right places? 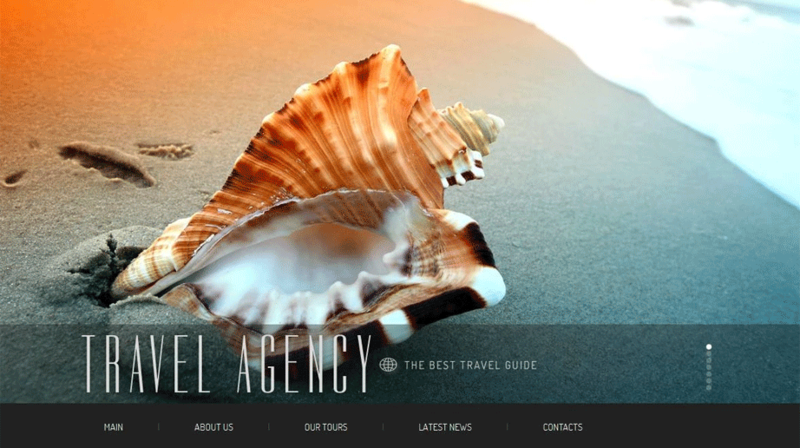 Take a look at the collection of the 12 hotels website templates to get inspired. 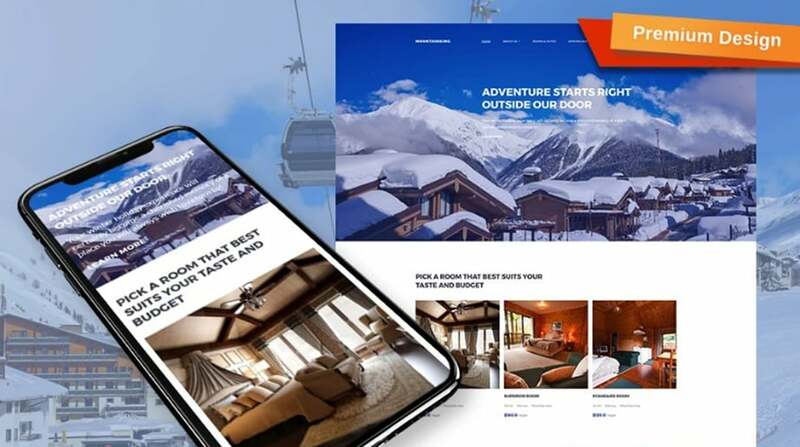 The mountain hotel website design is a premium-quality solution that is intended to be used for small to large-sized online projects related to the travel and hotels industries. The fully editable layout of the web page can be tweaked with just a few clicks of the mouse, without the necessity to work with the source code. The archive contains a number of the pre-designed pages, which are ready to make the web presentation of your project more informative and user-friendly. Special offers and deals are quick and easy to scan thanks to the spacious layout of the template. The online booking form is provided to let the customers take quick reservations on the site. 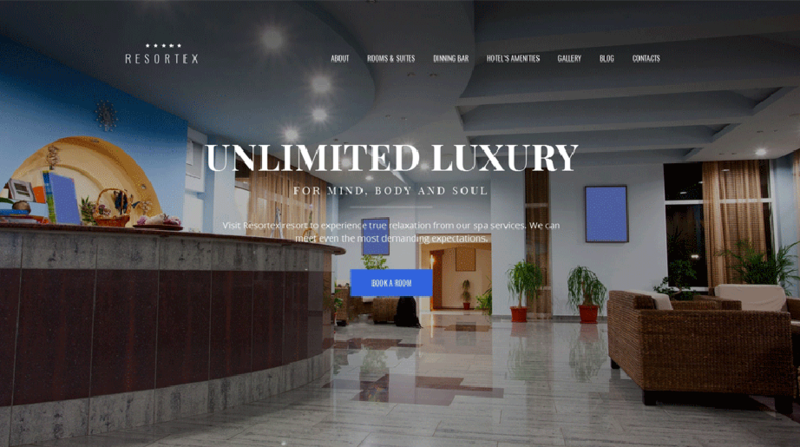 Resortex is a great example of the clean and refined hotel website design, which is intended to bring a more professional and luring presentation to the wide variety of the travel and hotels sites. The fully responsive design of its pages is intended to make every piece of content added to the site adjust to all screen sizes automatically. The intuitive drag-and-drop website creator allows even the non-techies to build versatile pages code-free. The template also includes a number of the customizable ready-made pages that are intended to make any hotel website more informative and usable. The availability of the online booking form lets the clients to make quick reservations on the site. 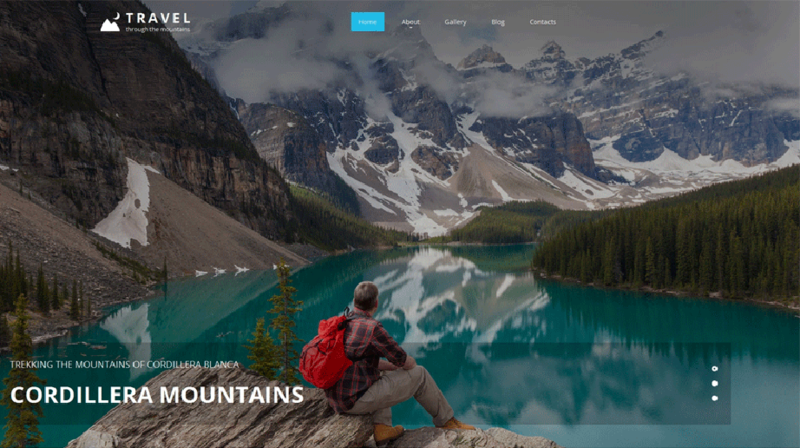 BoboTravel responsive Moto CMS3 template features a clean and spacious design, which presents the top destinations in the professional style. The layout of the template is enhanced with the parallax scrolling animation, which brings the feeling of depth to the web page. The theme supports all the major types of content. In addition to the quality images, the theme supports video backgrounds, which are known as the most effective conversion-boosters. In addition to the usable and informative presentation of the tours, the theme also includes a built-in blog, which is intended to keep the web audience updated about the latest industry news. 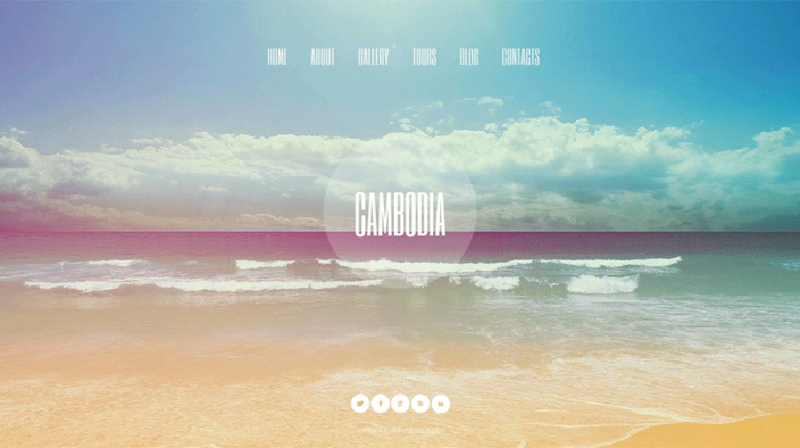 The theme’s layout is intended to handle the content-rich projects perfectly well. A page-width slider at the top of the homepage guides the users’ eye the hottest offers. The main navigation panel remains fixed at the top of the page, providing the web audience with the quick access to any piece of content they are interested in. The best offers are organized into a separate content block, which the users will definitely notice as they scan the page. A section with the user testimonials is also provided to bring a more trustworthy presentation to the web page. 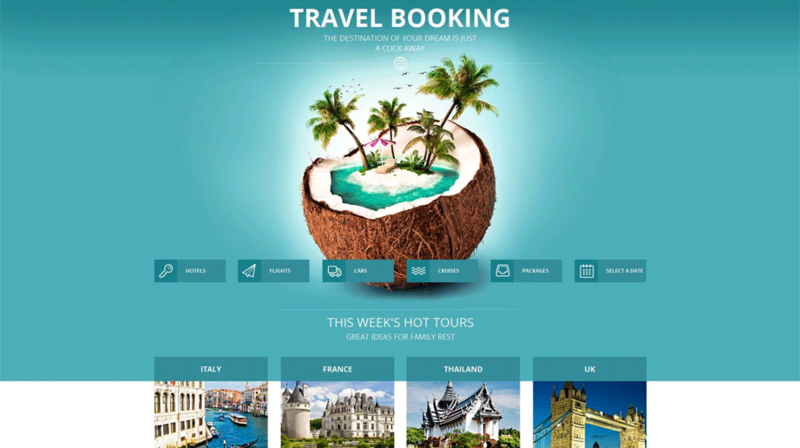 The theme will appeal to those travel agencies that are looking for a simple yet functional design to launch travel agency websites with the minimum effort. The clean and spacious pages of the template are created in the flat style. The design of the template is fully responsive. It can be tweaked code-free owing to the integrated drag-and-drop page builder. 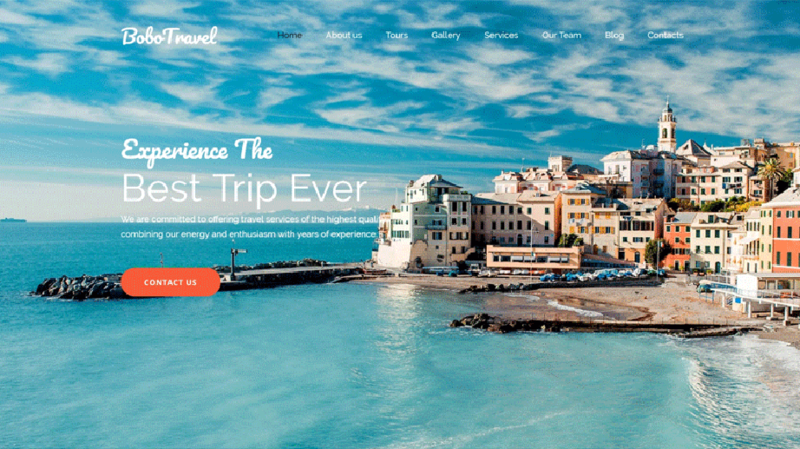 8 slider and gallery options are included to let you showcase the hottest tours effectively. 20 widgets and modules are also included in the download package. The hotel website design is created in the minimalist clean style. Designed with the user in mind, the theme also supports the easy content and layout editing process, making it possible to modify the ready-made layout without touching a line of code. For a more remarkable showcase of the hottest offers, the theme includes 8 slider and gallery options. With their help, you can enhance the pages of your site with background sliders, sliders with thumbnails, grid galleries, etc. The theme also features a built-in mobile version, which frees you from the necessity to invest extra cash in the development of the mobile version of your web resource. 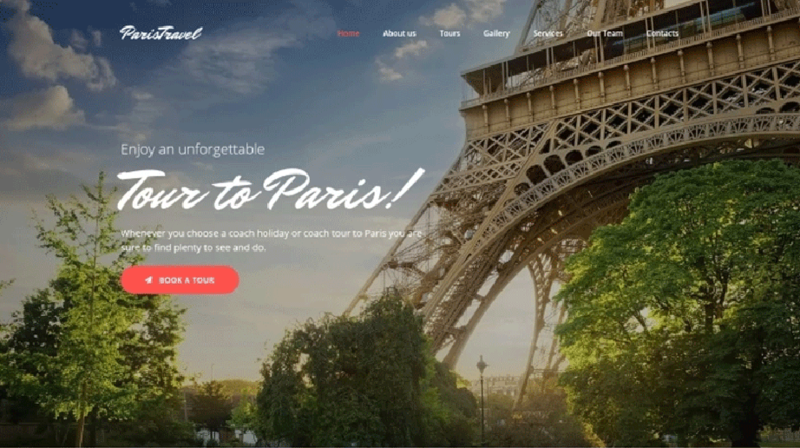 Paris Travel is the all-in-one solution from MotoCMS, which will help you get started with the eye-catching travel and hotel website designs really quickly and worry-free. The integrated drag-and-drop website creator allows you to create versatile layouts as you simply move multiple pre-designed elements with a mouse. The 100% responsive design of the template is optimized for the flawless performance on all screen sizes. The template also contains a number of the pre-designed pages that can be tweaked in the intuitive visual interface code-free. 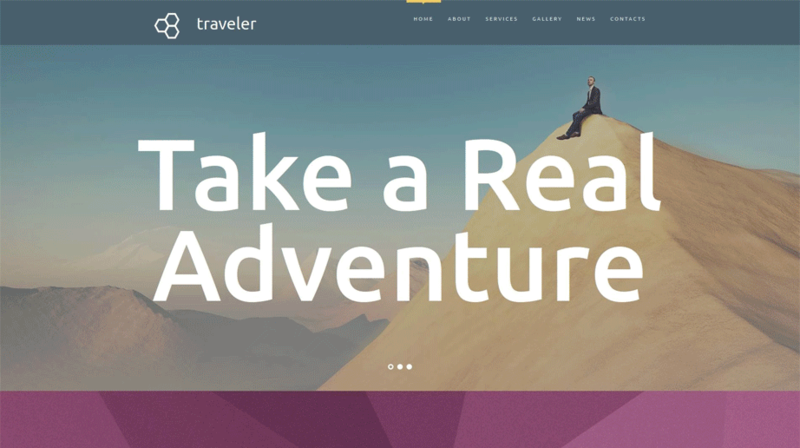 This ready-made travel website design is cross-browser compatible. It also includes a mobile version, which will display all content shared on the website on the smaller screens properly. The theme is integrated with the social media options, letting the web users feel the ease of spreading the preferred offers with a click. The 2-column layout structure is easy and intuitive to navigate. Thanks to the video integration and the availability of the 8 gallery options, the site administrators can add more diversity to the visual presentation of the content on the page. 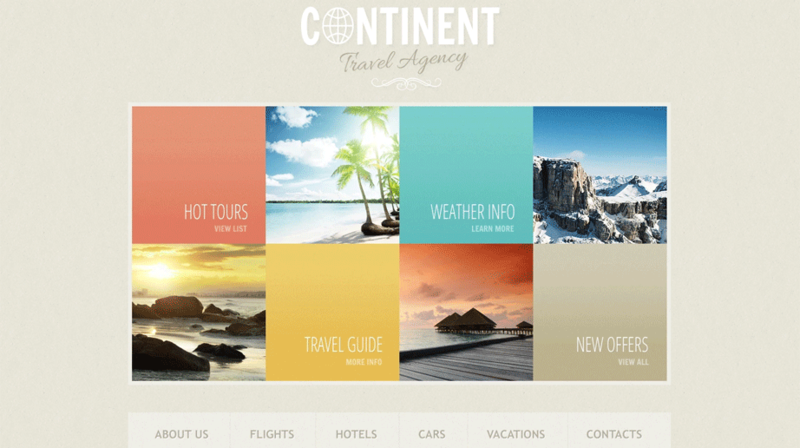 The theme is intended to be used for presenting travel companies in the neat and usable style on the web. Built in the soft, pastel colors, the design looks easy-on-the-eyes. 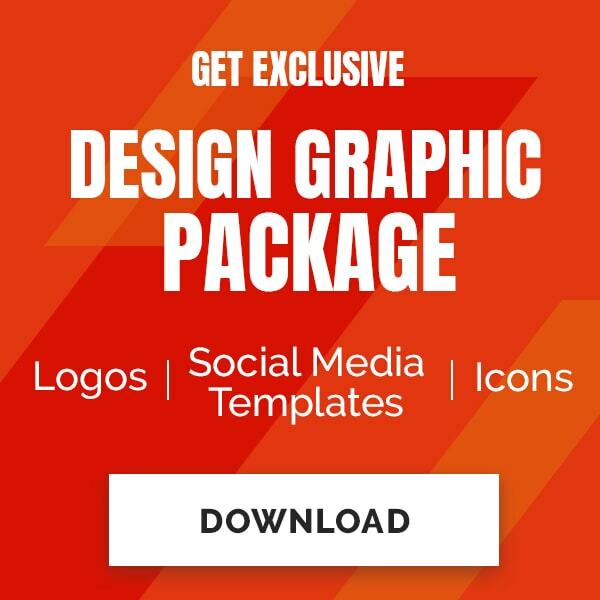 The fully editable layout of the theme can be tweaked in a number of ways to meet the brand identity and the corporate image of your organization perfectly well. The layout supports all content types. The built-in mobile version of the template will display all pieces of content on the screens of smartphones and tablets. 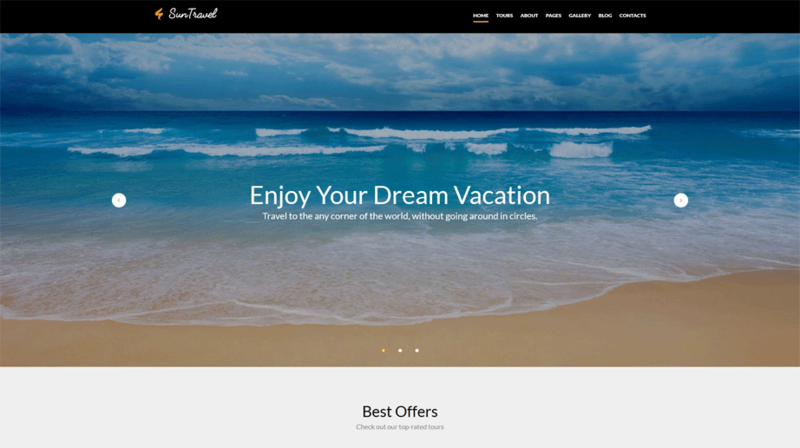 The theme is built with the SEO-friendly code, which will make the travel site more visible in the search engines. The theme is built with the usability in mind. The homepage of the theme features nothing except for the page-width photographic background, a drop-down menu, and the company logo placed front and central. The simple design of the template is easy and intuitive to navigate. 8 slider and gallery options are included in the download package of the template. 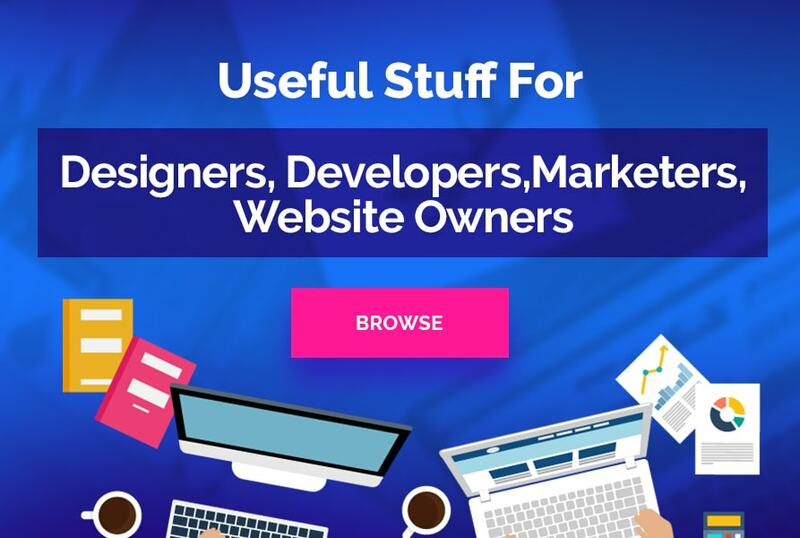 Whatever piece of content you’d like to be added to the site and whatever shape you’d like it to attain, you will be able to achieve the desired results with the help of the 20 widgets added to the theme. The fully responsive travel and hotel website design is intended to display all pieces content, both written and visual, on the screens of handheld and desktop devices perfectly well. The handy drag-and-drop layout builder allows you to take the full control over the organization of the layout structure, look and feel without the necessity to tweak the source code. The theme is also loaded with the presets builder, which allows you to modify widgets by means of the big diversity of the editable presets. Built with simplicity and usability in mind, the template doesn’t require you to have any special coding skills in order to modify its ready-made pages. The clean design of the template includes a collection of the 8 slider and gallery variations, making it possible to enhance the backgrounds with sliders, create grid galleries, reflection galleries, sliding galleries, and more. The theme includes a fully-featured mobile version. The code is SEO-friendly, making the site more findable in the search engines. Building user-friendly and appealing hotel website designs gets much easier and worry-free with the help of the ready-made premium templates from MotoCMS. Integrated with the drag-and-drop visual page builders, the ready-made hotel websites are integrated with all features needed to launch the fully-fledged online resources code-free.